New England is well-known for long cold winters and short, hot summers. 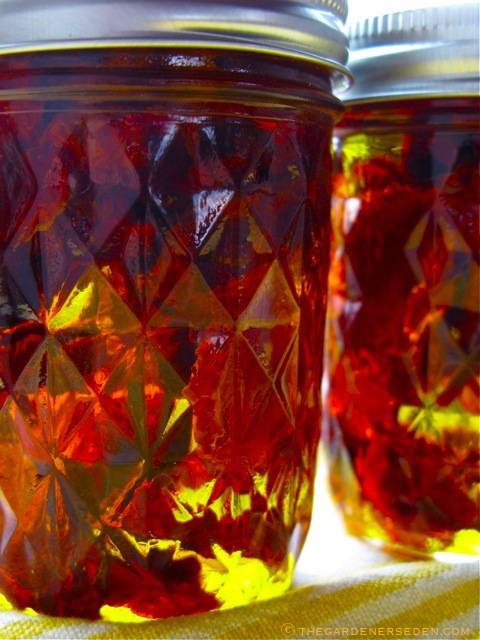 So gardeners here tend to know a thing or two about preserving the harvest for those freezing months ahead. August and September are prime-time in the vegetable garden. Heirloom tomatoes, beans, squash, cucumbers, onions, herbs and pretty much everything else in the summertime potager is at its peak. Often fruits and vegetables ripen so quickly, that we can not consume them all and produce begins to pile up all over the kitchen. Here are a few of my favorite ways to put food by. Click on any photo or link and travel back to past-posts on freezing, drying, pickling, braiding and otherwise storing your summertime favorites. Preserving fruits and vegetables need not be time-consuming or tedious, and in many cases, it can both save money and prevent the waste of extra produce that sometimes gets tossed in the compost bin. 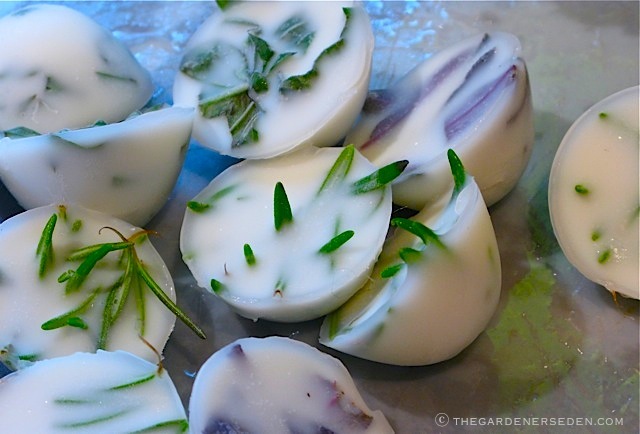 Fresh-Frozen Herbs in Olive Oil, Butter, Broth, Water or Juice – Enjoy Garden Fresh Cuttings in the Dead of Winter. Cubes Pictured Here were Frozen in Egg Holders with Light Olive Oil, Click Here for the Original & Popular Post on Freezing Herbs in Oil/Butter/Broth and Beyond. Tired of Spending Hot Summer Weekends Over a Stove? 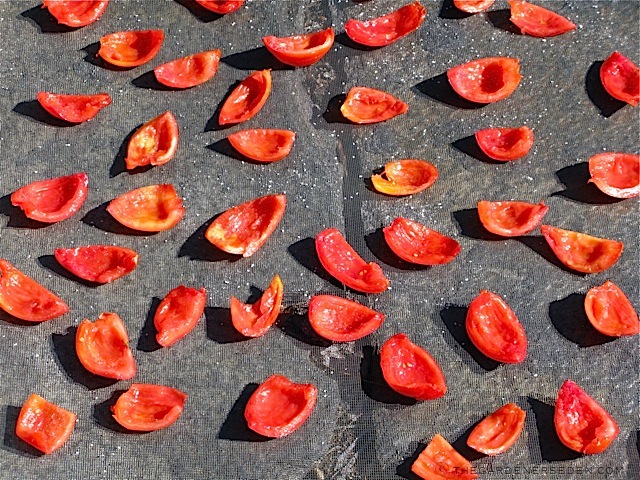 Start Freezing Tomatoes Whole, with Skin-On. 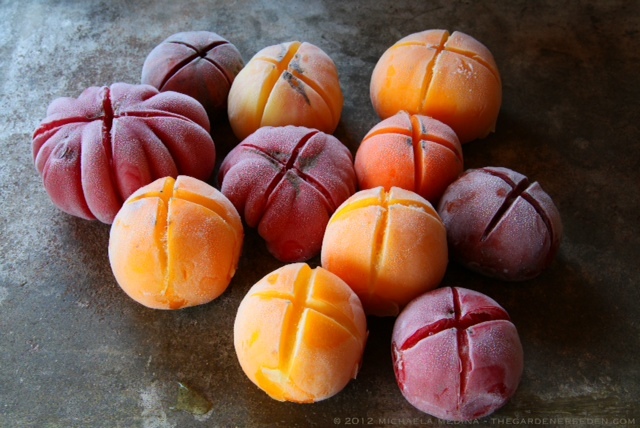 Thaw and Can Them Later or Use Them as You Would, Cooked in Pasta Sauce, Soup, Stew and Beyond. Click Here for a Few Simple Tips on This Process. Dried Bundles of Herbs from the Garden, Saved for Savory Soups, Stocks, Tea and Infusions. 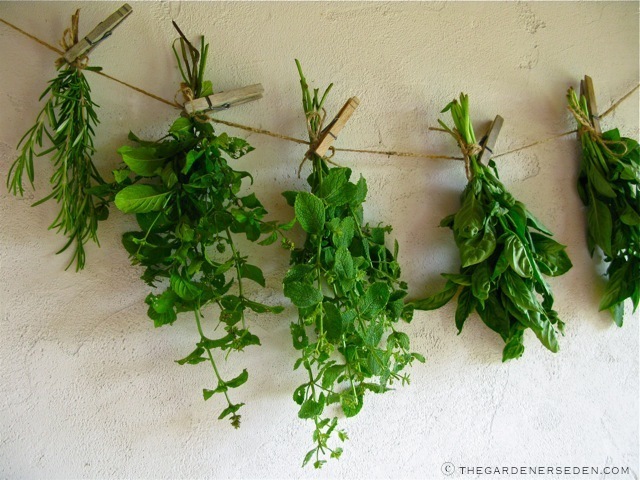 Click Here for Some Helpful Tips on How to Successfully Dry and Store Herbs. It’s hard to imagine cold weather on this humid, eighty-degree summer day, but winter is just three and a half months away. Savor these golden days of fresh-from-the-garden produce and as you are cutting up those fruits and veggies, remember to set some aside. When winter winds howl and snow banks reach the windowsills, you’ll feel snug and smug as you cozy up in your favorite chair with fresh tomato soup and herb focaccia. Yum. Dilly Bean Delight! Bring on the Polar Vortex Picnic Basket to Shake-Off the Mid-Winter Blues. 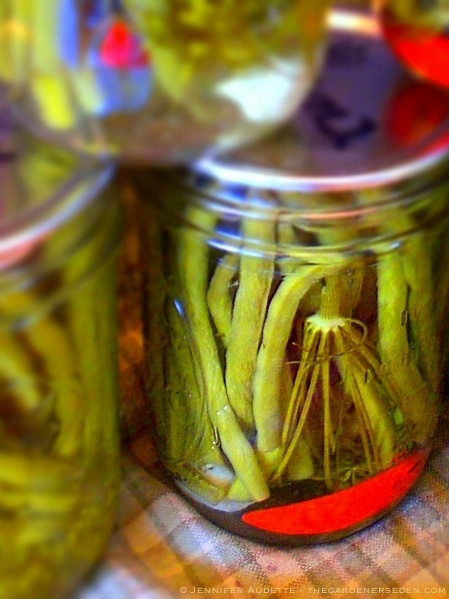 Click Here for Jennifer Audette’s Intro to Canning Post & Dilly Bean Recipe. 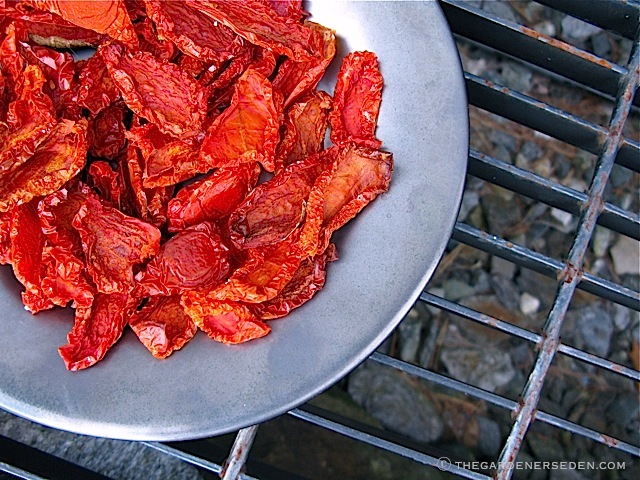 Sun-Dried Tomatoes Can Also be Stored in Baggies or Storage Containers and Frozen or Kept in a Cool, Dark Space. So Good in Pasta or with Roasted Chicken. Click Here for Process. No Dehydrator? No Problem. Place Tomato or Other Fruit Slices —Such as Apple or Pear— Out in the Sun on Screen Mesh. Leave Out by Day and Bring in at Night. Cover with a Second Screen if You Want to Protect Fruit from Insects. Click Here for More. 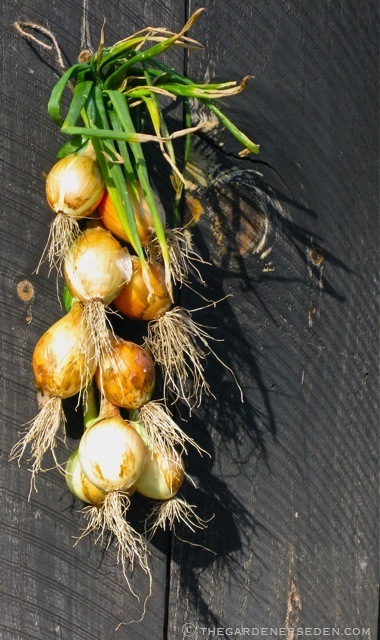 Braided Garlic and Onions are Pretty and Practical. Learn the Simple Process by Clicking Here. …Photography & Text ⓒ Michaela Medina Harlow/The Gardener’s Eden. All photographs, artwork, articles and content on this site (with noted exceptions), are the original, copyrighted property of Michaela Medina Harlow and/or The Gardener’s Eden and may not be reposted, reproduced or used in any way without prior written consent. Contact information is in the left side bar. Please do not take my photographs without asking first. Thank you! You are currently viewing the archives for Tuesday, September 2nd, 2014 at The Gardener's Eden.